If you have more than one printer, you’ve probably sent a file to the wrong printer more than once. That’s not a problem when you send a short, simple text document to the photo printer—you’re just out a bit of black ink. But if you send your 300MB, full-page, full-color bleed advertisement to the laser printer, you may find the machine locked up for quite a while. But all is not lost—with the right setup and some quick finger work, you can still set things right. First, to set up the ability to correct mis-routed print jobs quickly, put aliases to both your printers in the Dock. This will give you one-click access to your printers, no matter which app you happen to be using. The easiest way to do this is to open Printer Setup Utility (/Applications/Utilities), and then drag each printer’s entry in the list to a folder on your hard drive. From there, drag the aliases you’ve created for each printer from the Finder to your Dock (see “Docked Printers”). Now for damage control: as soon as you realize that you’ve sent a print job to the wrong printer, click on both printers’ Dock icons. This will open a window for each printer. Click on the window for the printer that received the job, and click on the Stop Jobs button in the toolbar—do this as quickly as you can to prevent the job from starting to print. Once you’ve stopped the job, all you need to do is drag and drop the print-job entry from the wrong printer to the right one. The job will begin processing on the other printer as soon as you drop it. If you don’t want it to begin right away, click on the other printer’s Stop Jobs button before dragging the job across. Docked Printers By placing your printers’ icons in the Dock, you’ll be prepared if you ever send a print job to the wrong printer. E-mail signatures provide a handy way to sign your messages with a pithy quote or with your name and address. One of the nicer new features in Tiger’s Mail is the ability to have multiple signatures for each e-mail account. Go to Mail: Preferences and click on the Signatures tab to enter your text. Then click on the plus sign (+) to add more signatures. Here you’ll also find a Choose Signature pop-up menu, which lets you specify how you select one of your signatures for use. You can pick just one, or you can have them rotate sequentially or randomly. I like to use a three-line signature; the first two lines are always the same, and the last line contains a witty saying. I use the random option, for a different signature in each new message I compose. Instead, pick a new random signature from your collection by clicking on the Account pop-up menu and reselecting the same sending account. When you do, you’ll get a new randomly chosen signature. This trick works even if you’ve already started typing your message. iPhoto’s smart albums are great when you want to use certain criteria to find a subset of your photos—say, all images created in the past week. But what if you want to do something more complex, such as find pictures of your cousins Bill and Will? Here’s an undocumented trick. If you’re using iPhoto 5, you can build smart albums that use a number of wild-card characters. Wild cards act as generic substitutes for other characters. iPhoto supports three: the asterisk (*), which stands for any number of characters, including none; the question mark (? ), which stands for any one character; and square brackets ([ and ]), which you can use to select from a list of characters. Be aware that to use wild-card searches, you need to have given your photos descriptive names, applied keywords (select Photos: Get Info and click on the Keywords tab), or typed comments in the Information text field (click on the i button at the bottom left of iPhoto’s window). Match all photos that contain a string starting with j and ending with n, with one character between those letters. This would find Jen or Jon but not Julian (since there are only three characters in our search string). 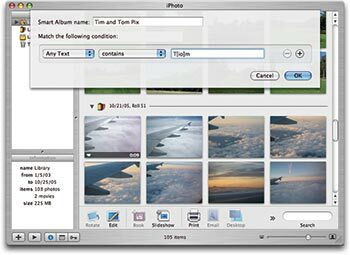 The Brothers T You can run some advanced searches using wild cards and brackets in iPhoto’s Smart Album dialog box. This one, for instance, will find all images that contain a reference to either Tim or Tom. Match any photos that contain a string starting with b and ending with e. So you’d see matches for base, bike, and brittle, and even be. You would not, however, see matches for brighten, since that has a character after the e.
Finds boat and belt but not burnt (since that’s got three characters in the middle, and we’ve only allowed for two). Finds only images whose text includes Tim or Tom (see “The Brothers T”). You’ll get lots of matches here, as it’s basically saying, “find any text that starts with a c, then has any number of characters (including zero), then has an r, and then has any number of additional characters (including zero).” So car, cars, characterization, and chart are all examples of words that would match. If you want to match an actual asterisk or question mark, enclose the special character in square brackets, like this: Kellie[?]. This search would match only images marked with the text Kellie? —which you might use if you haven’t quite identified some of the people in your images. Why type when you can talk? Here’s how to tap into Mac OS X’s voice-recognition abilities and map Exposé’s All Windows mode to a voice command. (The All Windows command shrinks every window you have open so you can see them at once.) If you like the way this works, try the same technique for any other Exposé or Dashboard commands. You’ll need access to a microphone, either built-in or external (the iSight has one, for instance). First, temporarily disable the Exposé and Dashboard shortcut keys you want to map to voice commands. Open the Dashboard & Exposé preference pane (simply named Exposé in OS X 10.3). In the Keyboard And Mouse Shortcuts section, select the appropriate pop-up menus (All Win-dows, Application Windows, and so on) and choose the last item, a dash (-). This removes each key-board shortcut. Next, go to the Speech preference pane and click on the Speech Recognition tab. Set Speakable Items to On by clicking on the appropriate radio button. The round Speech Feedback window will appear on your screen. This serves as your speech- recognition guide, and gives you quick access to a couple of interface options. Click on the small triangle at the bottom of the window to open either the Speech Commands window—which provides a dynamic list of available speech commands—or the Speech preference pane. To activate speech recognition, press and hold the escape key. Face your microphone and clearly say, “Define a keyboard command.” If your Mac understands you, you’ll hear a short “whiiit” noise, and the Define Keyboard Command window will appear.
. In the Use Command In section, make sure to choose the Any Application option; then click on Save. Now reactivate the All Windows Exposé keyboard shortcut. Go back to the Desktop & Exposé preference pane, click on the pop-up menu next to All Windows, and choose F9 from the list of available options. That’s it—start talking!